Mark Twain once said of the cauliflower, "a cabbage with a college education". He was right about the cabbage connection because both come from the same vegetable family (Cruciferae) as does broccoli, rocket, brussel sprouts, bok choy, mustard greens, radishes, kale and even the swede. Today it seems to me that the cauli has been overlooked for its green cousin broccoli. This could be due to the way cauliflowers were served up to us as kids. How many of you think of cauliflower cheese when a cauliflower comes in view? Because it's not green we somehow think the white curd of cauliflower doesn't share the same good food properties as broccoli. How wrong we are! 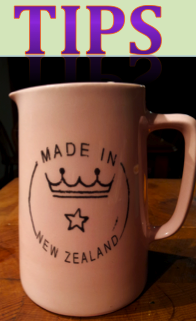 While there are still some cauliflowers about I would like to share with you a winning recipe from "Pipi the cookbook". 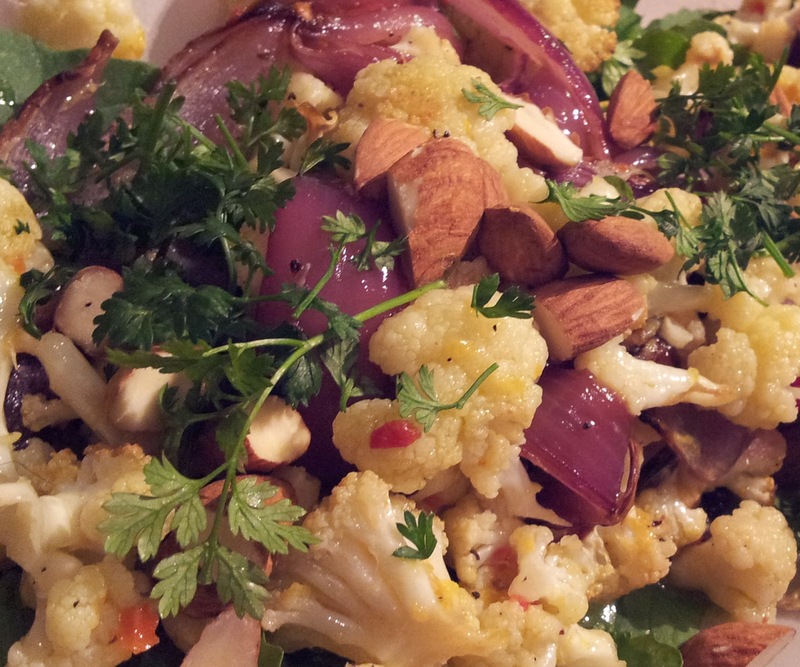 I have served this frequently as a warm salad option to much acclaim as it brings out the true nutty flavour of cauliflower. It can be served cool but I wouldn't serve it chilled because it will lose flavour. It's a good salad to have when the weather is still not that warm. The secret is roasting the cauliflower and onions and letting the orange and olive oil dressing soak in while still hot. The cauliflower is dressed with oil as per the onions and place on the second half of the hot tray 20 minutes into cooking the onion. It takes 20 minutes for them to be soft all the way through but not mushy (stir frequently). While this is cooking prepare the dressing. I usually lay a bed of green leaves on a platter and then the salad. I find rocket a good peppery addition. The greens will soak in the plentiful dressing. Cover with almonds. 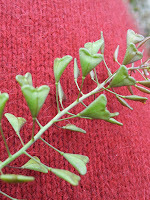 parsley and red peppercorns (or any other colour addition to the dish like calendula petals, or finely sliced red peppers when in season). I have often replaced the parsley for chervil because of its delicate leaf and aniseed flavour. I made this salad over the weekend for friends and as I could only find one small cauli at the market, I did 50/50 broccoli/cauli and it still worked well. I cook the cauli a little longer than the broccoli. You could use all broccoli if you prefer. I ran out of almonds and used freshly shelled and roasted walnuts instead and it was just as delicious - you could also use hazelnuts. If you have a small cauli you need to halve this recipe. There is plenty of dressing in the recipe and I usually have some leftover to toss through a green salad as well. Otherwise, the dressing will keep for a week in the fridge. Named Cruciferous because of its flowers. They have four equal-sized petals that form a crucifix or cross-like shape. Any of you growing rocket will notice as weather warms they quickly bolt to flower and their white flowers have this distinctive cross shape. (By the way I use the rocket flowers in salads). But the name "cruciferous" is undergoing change. Scientists are now starting to favour the term "brassica vegetables" instead, and that makes sense if you are a gardener. This family of vegetables come out on top of the nutrient charts. Scientists have been studying them for their cancer prevention qualities. It's suggested you eat vegetables from this group at least 3 times a week, preferably five times, and have a serving size of a cup and a half. Like carrots they are better cooked with oil or butter to get the most of the beta-carotene and minerals. 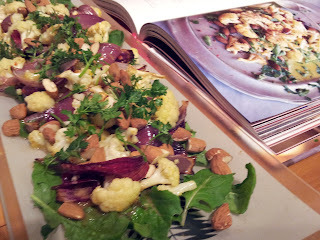 Alison Lambert, the Otago Farmers Market chef, has a really good quick recipe for sauteed cauliflower. I witnessed her turning around previous haters of cauliflower with this method of cooking. Cauliflower will keep in the refrigerator for a week but it should be stored with the stalk down so that air can circulate and no moisture gets into the curd (head). Always pick a cauliflower with a white firm curd - not starting to separate. Cauliflower will keep much longer if it still has its green protection leaves in place. Cauliflower will turn yellow in alkaline water, to keep white add a little milk or some lemon juice to the water. The curd or head of the cauliflower will become discoloured and bitter tasting if exposed to too much sunlight. So once the curd reaches the size of a tennis ball, pull up 3 or 4 of the outer leaves and tie them loosely around the curd - this is called blanching. It is usually ready to pick within a week or two after blanching. Plant them early spring and in late summer. They require rich soil that retains moisture - and a fortunate run of weather because they will bolt if too cold or too hot and dry. I have to admit I haven't had a lot of success with cauliflowers and usually opt to buy them from the market. They are a bargain when I think how difficult it is to grow them. I thought this year I would have another try with the 6 purple caulis seedlings I planted a few weeks ago. 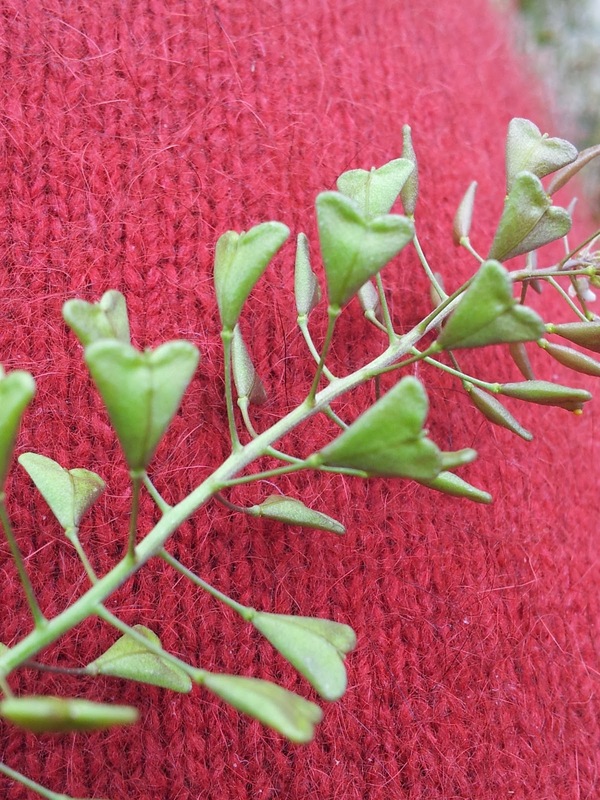 Shepherds Purse was the first plant I remember learning about in primary school - I was fascinated by its name and the heart shaped pouches. It was named because the fruit resembles the shape of the purses carried by the shepherds of Bethlehem. Through the centuries it has also been called Witches' Pouches, Poverty Weed, Mother's Heart, Poor Mans Pharmacy and many more. I had no idea that this little "weed" was actually related to the cauliflower until I discovered it on the Cruciferous family list. You can eat all of this plant - the little seed pouches are peppery and can be added to soups for an added zing and the dried roots have been used as a substitute for ginger - no less! Its used as a food in Japan, China and Korea. 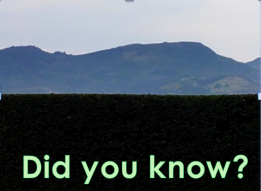 It's had a history of use as a medicinal herb and is supposed to stop bleeding. In China it's used to reduce fertility and is traditionally used in childbirth because of its uterine-contracting properties. 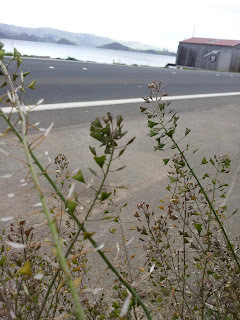 Usually found on waste or roadside land as a pioneering plant, its a weed that appears on poor or recently disturbed soil. 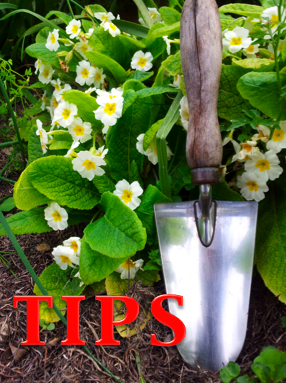 If it's growing in abundance in your garden then it's an indication that your soil needs some help. Rather than pulling it up immediately why not let it do some of the work for you by absorbing excess salts and turning them into organic compounds. 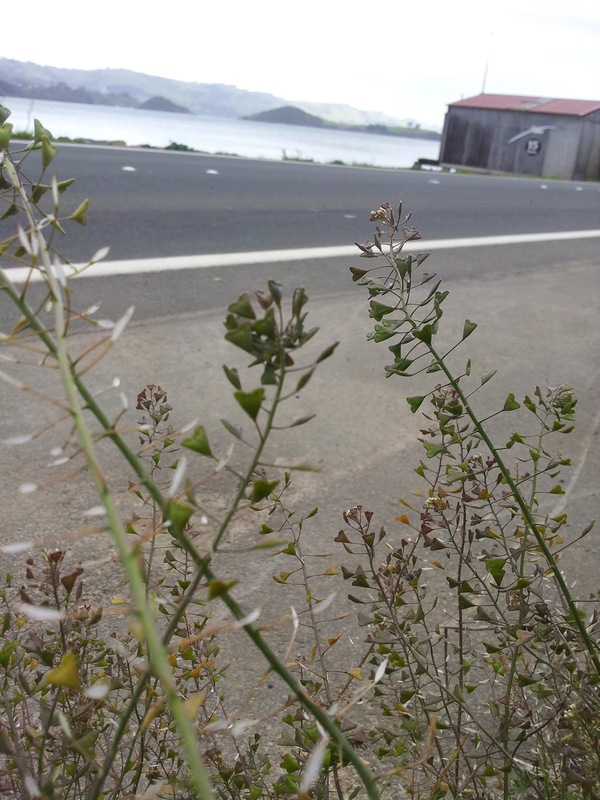 Shepherd's Purse is in its full fruiting glory on the Otago Peninsula. It's going to seed just like its cousins rocket and kale - indicating to me that it is warming up here in the south.....a little.